Have you ever heard someone say that “Black’s the easiest tattoo color to remove with a Q-switched laser”? That tired phrase was coined due to the fact that Q-switched lasers could not remove colors such as blue and green among others. 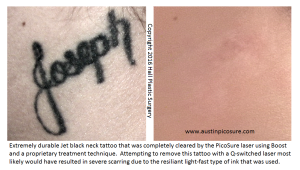 In my practice, I see many patients with scarred black tattoo remnants that were unsuccessfully treated with Q-switched lasers. Fortunately, the patients finally gave up in frustration and sought me out to remove the residual ink and fix the scarring – which I do on a daily basis. So why is it suddenly so difficult for a POS Q-switched laser to remove the one color they actually had some success with in the past? The answer is in the ink. Modern ink is much more dense and lightfast than it was in the sixties and seventies when Q-switched lasers were invented to remove old India ink tattoos. Black ink today has several proprietary components that manufacturers add to make the pigment extremely tough. These ingredients include pure carbon powders and metals that cannot simply be removed through the photothermal action of a Q-switched laser. In fact, lack of success often leads to frustration and overtreatment which causes scarring and permanent pigmentation changes. In the photo below we see a tough black ink that was used to create a neck tattoo. The ink was almost glossy in appearance which is a giveaway that it contains special ingredients to make it tough and colorfast. Luckily for this patient the PicoSure laser with Boost, combined with a proprietary treatment technique, was able to completely remove the ink while not harming her beautiful skin. If you suspect that your unwanted tattoo contains tough modern inks, I can be reached by phone @ 512-479-9997 or just stop by my NEW location in Austin, TX: Austin Medspa on W. 6th St.